With Saturday night’s loss to Washington State it is now pretty much official that this year’s version of Oregon football is going down as a bad year, the end of the streak, or some other description that is even less complimentary. The 3-3 Ducks are only a play a game away from being 5-1, but there’s no “coulda-woulda-shoulda” about it. The passing offense is meager and the passing defense statistics are competitive with the worst college football has to offer. The recruiting pitch has gone from “chance to play for a championship team” to “chance for early playing time” in less than a year. The armchair quarterbacks have to be going nuts. How we got here and how long it might take to turn it around is the subject of this week’s Three-and-Out. 1. The recruiting issue. The armchair quarterbacks are going to put complete blame on the present coaching staff, point out that it was Chip Kelly’s recruits that got us through the last two successful years and say that Mark Helfrich’s recruits aren’t getting the job done. Oregon football recruiting hit its high point (so far) with the 2010 and 2011 classes, ranked 9th and 13th. The program was on the rise, and the opportunity for even stronger recruiting classes was there, but it didn’t happen. The 2012 recruiting class slipped to 16th and the 2013 class dropped further to 22nd, despite ending seasons with Rose Bowl and Fiesta Bowl wins. 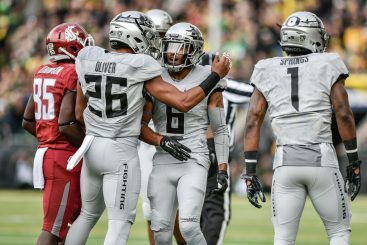 The youth in Oregon’s secondary has roots going back to the Willie Lyles case. There were two things that dampened recruiting during that phase. The Willie Lyles scandal dragged out while Kelly wavered over leaving for the NFL over during both recruiting cycles. 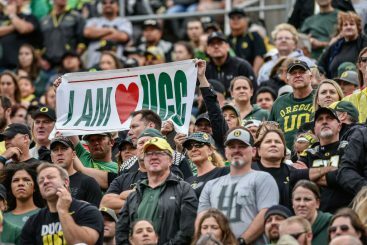 It gave opposing coaches plenty of ammunition to take to the living rooms of recruits, and Oregon’s recruiting took a step backward at the very time it was poised to surge forward, based upon team performance. 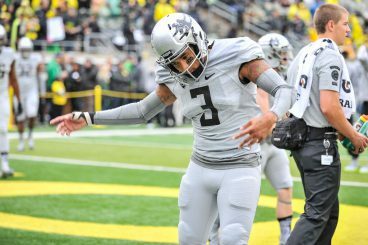 The 2012 and 2013 recruiting classes were further cursed with some disciplinary dismissals — primarily of defensive secondary players — and transfers for playing time at quarterback, owing largely to Marcus Mariota’s success. The 2012 and 2013 recruiting classes are now in their third and fourth years in the system and comprise the upper class leadership. To blame the current coaching staff for thinness in these classes is not entirely accurate. After all that — a broken finger. 2. Murphy’s Law. What could go wrong will go wrong has certainly applied to the 2015 team. Vernon Adams’ delayed entry into the program and subsequent injury, along with injuries to most-experienced cornerback Chris Seisay, Thomas Tyner and Byron Marshall completed the perfect storm. Consequently we’re halfway through the season with the quarterback situation a complete mess, a defensive secondary that bends and breaks and operational problems on both sides of the ball. 3. How long will it take? A healthy Adams is probably the only possible ray of hope for 2015, which has all the makings of a dismal season. Armchair quarterbacks no doubt have all kinds of suggestions for the defense, but it is doubtful that the coaches will read all the comments on the blogs to come up with a solution. With the toughest part of the schedule still ahead, it doesn’t seem likely that this season is going to get turned around. 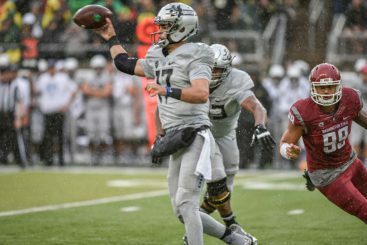 Oregon’s downfield passing game was nonexistent vs WSU. So sadly, halfway through the season, it is time to start thinking about next year. Adams will not be an option at quarterback. That leaves Jeff Lockie (who has thrown three end zone interceptions so far this season) and walk-on Taylor Alie with experience. Redshirt freshman Morgan Mahalak (6’3″ – 205) is getting a lot of snaps running the scout team and true freshman Travis Jonsen (6’2″ – 195 and currently out with an injury) was the No. 3-ranked dual threat QB in last year’s national recruiting class. Currently committed to Oregon in the 2016 class are Terry Wilson (6’3″, 190) and Justin Herbert (6’6″, 215). Both are only rated three-stars by rivals.com, but so was Mariota. Herbert, from Eugene’s Sheldon High School, has a strong arm and shows exceptional mobility for a big guy — and the view has to be pretty good from up there. That gives the Ducks at least six chances to come up with a starting QB for next year. Let’s hope for the best. This year’s defensive secondary has no seniors and only one junior in the two-deep, and next year the group will be joined by two high rollers in the 2016 recruiting class: No. 10-ranked safety Brady Breeze and N0. 9-ranked cornerback Jared Mayden. In spite of 2015 appearances, John Neal does know how to coach defensive backs, so things are bound to get better — which is easy to say when having things get any worse is pretty much unimaginable. Next year’s front seven on defense and the offensive line will see some turnover of starters, but what’s returning on the two-deep looks solid. Running back and receiver positions should be loaded at least through next year. As dismal as things seem for the moment, the coaches are working through problems that stretch back three and four years. It’s really more a matter of a few too many things piling up and not working out than it is inability to plan ahead or inability to coach. Whether it’s football or anything else in life, sometimes bad things just happen. This, of course, does not change the fact that it is the coaches’ responsibility to fix it. If Helfrich can right the ship, it will be all his, with Kelly a distant memory. If not, someone else will get the chance. That’s the way college football works. Soul experiences run deeper than losing a football game. Rose Bowl victories and double-digit win seasons lift the spirit, but what we have before us is a time that tries fans’ souls. It’s good practice for life’s happenings that really matter. 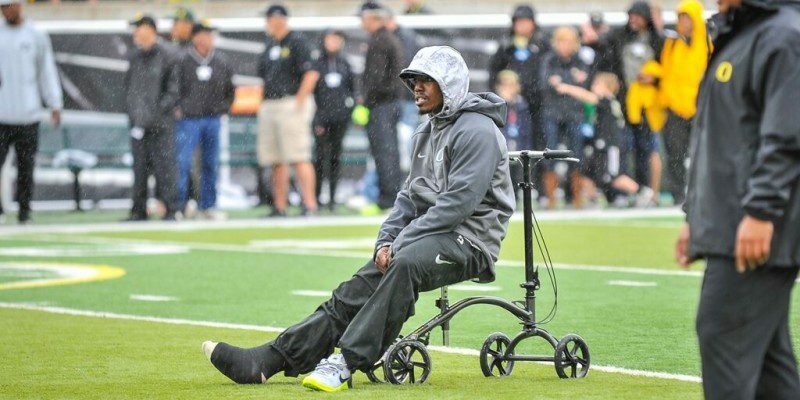 The state of Oregon was reminded only too recently that trials of the soul run much deeper than football seasons that do not meet expectations. Even in sports, though, steadfastness comes from soul, not from spirit. Those who are on board only for the high of victories will be long gone before all is well again. But for those with a little bit of Duck in their souls, this is just one ugly, nasty passing storm.